The University for Peace (UPEACE), San Jose, Costa Rica, was established by the United Nations General Assembly pursuant to its Resolution 35/55 of December 1980 to "provide humanity with an international institution of higher education for peace and with the aim of promoting among all human beings the spirit of understanding, tolerance and peaceful coexistence, to stimulate cooperation among people and to help lessen the threats to world peace and progress..."
The UPEACE performs its noble task under the slogan "SI VIS PACEM – PARA PACEM" (If you desire peace – prepare for peace). Where did the ECPD get its name from? 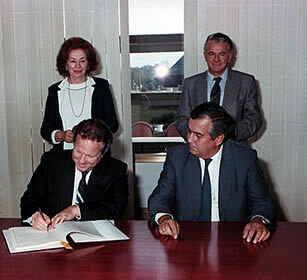 The word "European" forms part of our name, because the Center was established under an international agreement to operate in the territory of "Helsinki Europe" which, as is known, includes the countries of Europe and North America". The words "and Development" stem from the awareness that a lasting peace cannot be ensured unless the countries and nations, to which destiny was a stepmother, start to develop in a considerably faster and more harmonious way than hitherto, as well as from universal truth that there is no peace without development.